At the foot of the hill, upon which the Stone Chapel now stands, lies another devotional area, the Grotto of Lourdes. The miracles of Lourdes were much in the minds of the people, and immediately after the beginning of the pilgrimages, a simple oil painting of Our Lady of Lourdes was placed in a cave, made for its protection. Later, a grotto was built to resemble the one at Lourdes. A benefactor then presented the present statue of the Immaculate Conception and another of Bernadette Subirous, to whom Our Lady appeared. Just as Lourdes is a fountain of grace, so here too, the Blessed Virgin comforts many who come to her in need. There was no water at the grotto, so Father Hoehn prayed to the Blessed Mother for a fountain of fresh water. The proposal was made to dig a well. Farmers of the area were pessimistic and protested that there was no water there. They thought that only surface water would be found. Nevertheless, they began to dig. On the third day, a water vein was struck, much to their delight, and good soft water pressed forth. This water vein was struck on September, 3, 1900, the feast of "Mary Comfortress of the Afflicted." Here, the tired Pilgrim could refresh oneself with good, cool water. The event was inscribed in a stone at the well in the following words, "Through the intercession of the Blessed Mother of God this fountain issued forth on the Feast of the Comfortress of the Afflicted, September 3, 1900." Shortly after the digging of the well, Father Hoehn went to France. He brought back with him a large container of water from the Shrine of Lourdes, which he poured into the Starkenburg well. The devotion of the people increased even more. Due to the deterioration from the elements, the Shrine was torn down and rebuilt by Kaletta and Company of St. Louis in 1934. 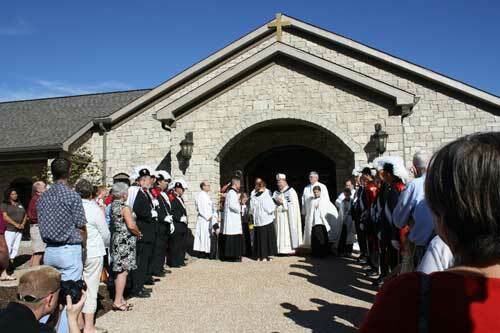 On September 16, 1934, the new Grotto was dedicated. In 1997, water was brought from the Shrine of Lourdes, and added to the well at a Pilgrimage in 1997. In 1904, Fr. Hoehn received word from a group of St. Louis pilgrims that planned to donate a statue of the Blessed Mother to be carried in pilgrimage. Father had the original statue, with which the pilgrimage had begun, restored. Since this statue had been used for years, he wanted the tradition to continue. However, the September Pilgrimage was not to pass without a special donation from the St. Louis Pilgrims. Near the Lourdes Grotto, at the foot of the adjoining hill, a small stream flows from which rose a densely covered hillside. There, a grotto could easily be made, for a statue of the Agony in the Garden. It was built of rough stones and the statue donated by the St. Louis Pilgrims was placed inside. The stream at the foot of the hill was name Cedron and the entire are gave a suitable place for meditation and prayer. On August 14, 1904, a torchlight procession to Mount Olivet was held. Reverend Vicar General O.S. Hoag, of St. Louis, blessed the Shrine and dedicated it to everyone in deep affliction. He was assisted by Rev. Joseph Wurm, Richfield, Wisconsin, Rev. P. Daniel of Precious Blood, Father Hoehn, and his assistant, Rev. J.M. Denner. Dr. S. Lebl, Professor of Provincial Theological Seminary of St. Francis, Wisconsin, delivered the Sermon. A marble slate, placed on the Grotto, bears the inscription, "In memory of the Jubilee Pilgrimage, the 29thday of May 1904, this Group of Mount Olivet was presented by the St. Louis Pilgrims." 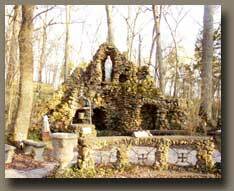 By 1941, the Mount Olivet Grotto had deteriorated and it was decided to rebuild it. 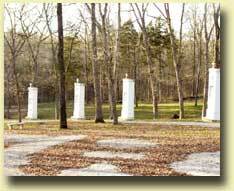 They chose a spot somewhat south of the original so that it could be more aligned with the Lourdes Grotto. Rebuilding was done by Kaletta and Company of St. Louis. 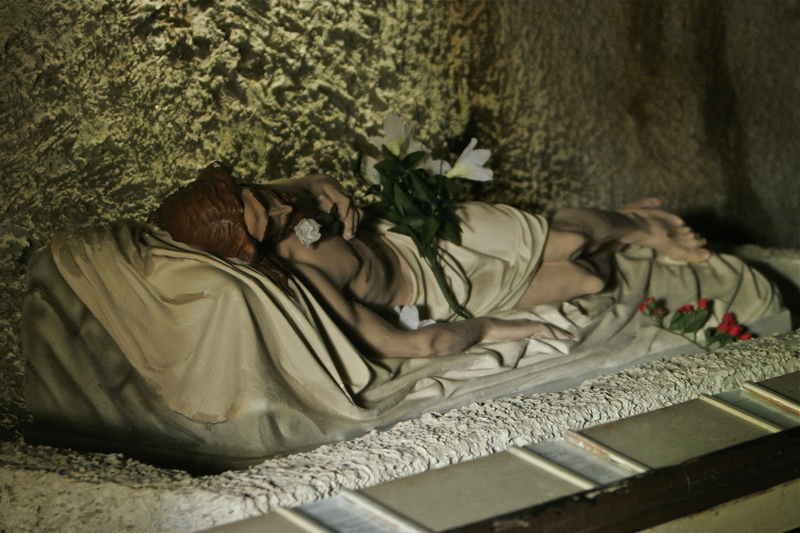 Into this grotto, the original statue was placed.